Lexus is set to unveil an all-new RC F Track Edition as part of an extensive update that boosts the performance and freshens the overall look of its flagship performance coupe. The RC F Track Edition offers exclusive upgrades designed for hard-core enthusiasts, blending a serious performance car for the track with the luxury and craftsmanship expected of a Lexus. Stand-out new features include a carbon fibre roof and bonnet, titanium muffler and tailpipes, Brembo® carbon-ceramic brake rotors, substantial weight reduction and styling enhancements that improve aerodynamics and increase downforce. Combined with a new launch control feature standard on every RC F, the Track Edition is targeting acceleration from 0-to-100km/h in around four seconds. This new variant is the latest milestone for the F performance brand that will continue to evolve as an important pillar of the overall strategy at Lexus. The Track Edition will be revealed at the Detroit auto show alongside the standard Lexus RC F performance coupe which has been extensively updated. Sleeker aerodynamics, reduced weight, a retuned suspension and enhanced styling elevate the RC F to a new level of performance and refinement. Lexus International executive vice president Koji Sato said the new RC F and the Track Edition, in particular, have benefited from constant development. “These models help further distinguish the F brand by offering fast, durable, highly capable performance cars that rely on a range of technologies to help make their performance accessible to drivers of all skill levels,” Sato-san said. Lexus engineers have reduced the RC F’s weight without compromising the coupe’s sense of refinement and solidity. Hollow rear axle-shafts are now used in place of the previous solid shafts while a smaller intake manifold and air-conditioning compressor remove weight from the front of the car. Adopting aluminum toe-control brackets and upper suspension support brackets also reduces weight while maintaining stiffness. Stiffer bushings for the rear suspension arms and steering rack mounts further refine the feel of the RC F. More rigid engine mounts better transmit the power of the RC F’s normally aspirated 5.0-litre V8, one of the last such engines available in a luxury coupe. The engine has revised intake routing and a lower rpm trigger point for the secondary intake opening (2,800rpm vs 3,600rpm). It is mated to an eight-speed automatic transmission. Standard electronic launch control provides the ultimate in standing-start acceleration. With a push of the button on the console, the system automatically adjusts the traction and throttle control for maximum acceleration from a stop. All the driver has to do is press and hold the brake pedal, engage the system, floor the accelerator to bring up the engine speed and release the brake. Using the system results in a 0-to-100km/h time of just over four seconds. Additional performance gains are delivered by new Michelin Pilot Sport 4S tyres designed specifically for the RC F with a unique profile shape, tread pattern and rubber compound. The changes are specifically designed to reduce understeer, improve overall lateral grip and increase durability under extreme conditions. Subtle but substantive changes styling changes add familial traits to further refine its aggressive overall shape. Headlights now feature stacked LED lights and integrated daytime running lights. The signature grille gains a lower lip opening that stretches across the bottom to create a visually shorter front fascia. New taillights integrate neatly into a reshaped bumper to give the RC F a cleaner, more chiselled appearance. Precisely engineered upgrades for the RC F Track Edition work together seamlessly to push its performance to a new level. Developed with input from Lexus race teams in the Super GT and IMSA series, the Track Edition is designed to deliver exceptional performance that enthusiasts can easily exploit in a wide variety of conditions. Achieving that level of predictable performance was made possible by rigorous engineering and the assembly precision of Takumi masters who oversee production of every RC F.
All aspects of the car were scrutinised for improvement, resulting in an uncompromised luxury performance coupe with the ability to impress both on and off the track. A unique front air dam, made from carbon fibre to reduce weight, is designed to increase front-end downforce for better grip and more precise steering. A fixed rear wing, also made from carbon fibre, is lighter than the active spoiler offered on the standard RC F. The fixed wing also reduces drag and adds up to 26kg downforce. 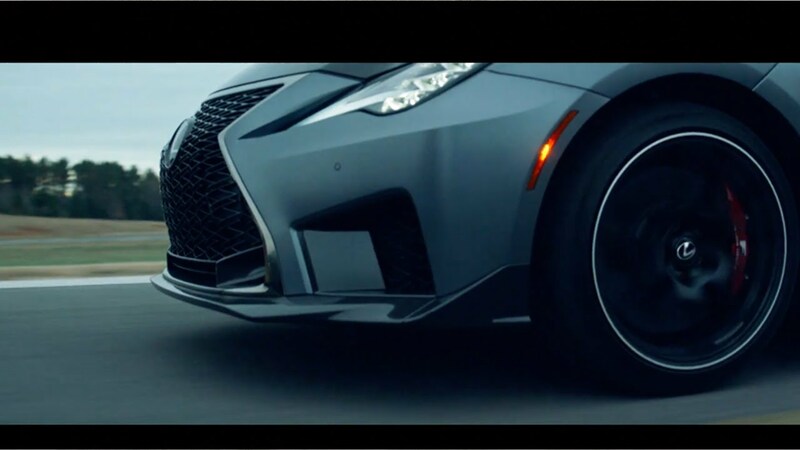 Preliminary estimates put total weight reduction at 65kg compared with the previous RC F with engineers focused on cutting weight that yields the most significant dynamic improvements. Every Track Edition model is upgraded with Brembo carbon-ceramic brake rotors that are lighter than their steel counterparts and better able to withstand the extreme heat cycling associated with performance driving. They are surrounded by a set of lightweight 19” BBS forged alloy wheels that feature a design derived from the RC F GT3 race car. The wheels, brake rotors and calipers result in a significant 25kg reduction in unsprung weight on the front of the car alone. Additional weight was removed by specifying carbon fibre for the roof and bonnet along with switching to a carbon fibre partition behind the rear seats and a carbon bumper reinforcement. Many of these carbon fibre pieces will be made on the same line that supplied the Lexus LFA during its two-year production run. A standard titanium muffler and tail pipes also helps the Track Edition shed weight. Rarely seen on production cars, the use of titanium also gives the Track Edition a polished look along with a unique sound. Using the same normally aspirated 5.0-litre V8 found in every RC F, the RC F Track Edition is targeting a 0-to-100 km/h time of around four seconds. In order to give the Track Edition a more exclusive look on the inside, a red leather interior comes standard along with Alcantara® seat accents and red carbon trim on the doors and dashboard. Four body colours will be available: white nova, sonic titanium, graphite black and matte grey, the latter exclusive to the Track Edition. Production of the updated Lexus RC F and the RC F Track Edition will start in the second quarter of 2019. A performance vehicle for a powerful and highly responsive drive. The current generation RC F will get your heart racing.